Making her debut on stage for the first time is "Destiny Awaits" & she can't wait any longer! Below are photos of her in her various forms. 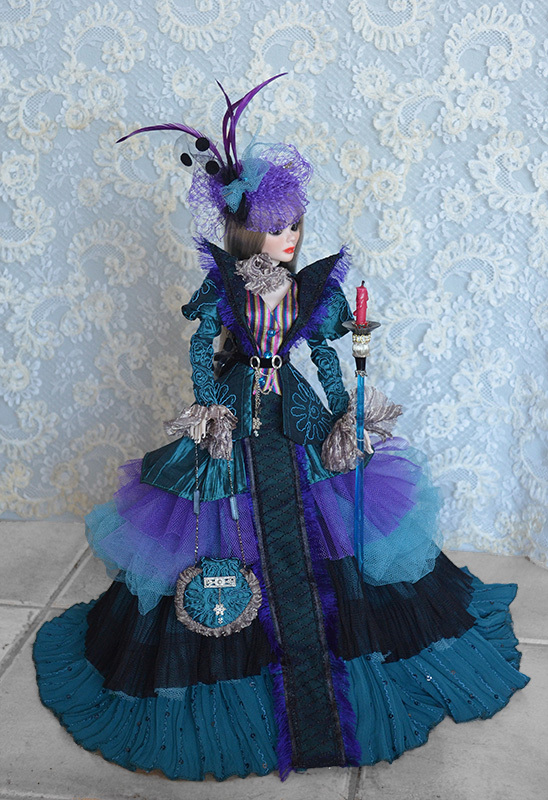 She can be seen in her plastic, resin & vinyl persona wearing this OOAK outfit that has been designed for this very occasion. 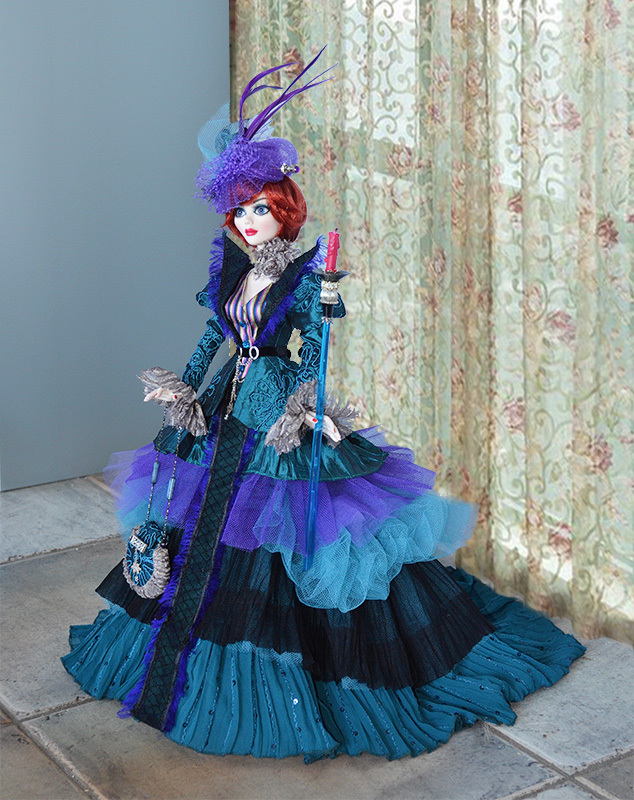 She appears in wigs of different colors & lengths to add a little spice & you will notice the way gauntlets & jackets are removed & swapped to add even more variety to this highly detailed ensemble. 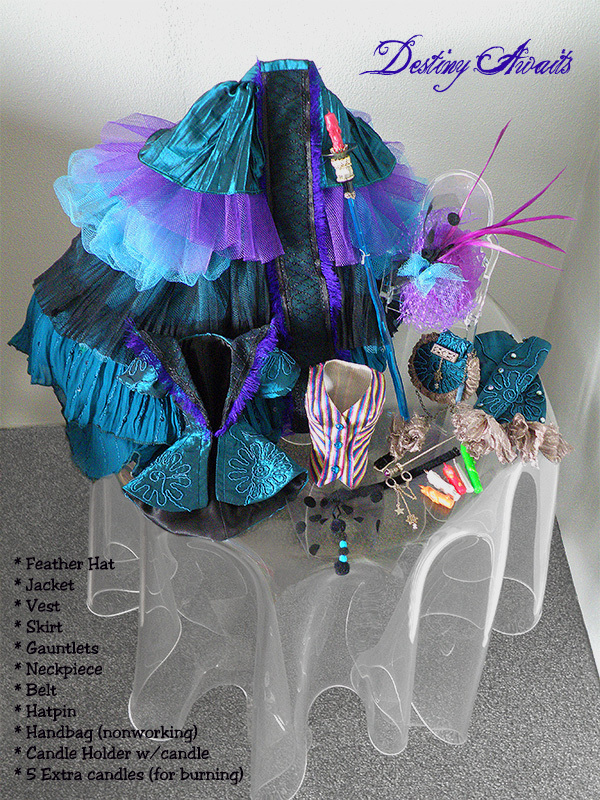 Yards of fabric have been employed to assemble the skirt of semi sheer crinkle frill with sequin trim, fine black crinkle net & yards of teal and purple net frills. 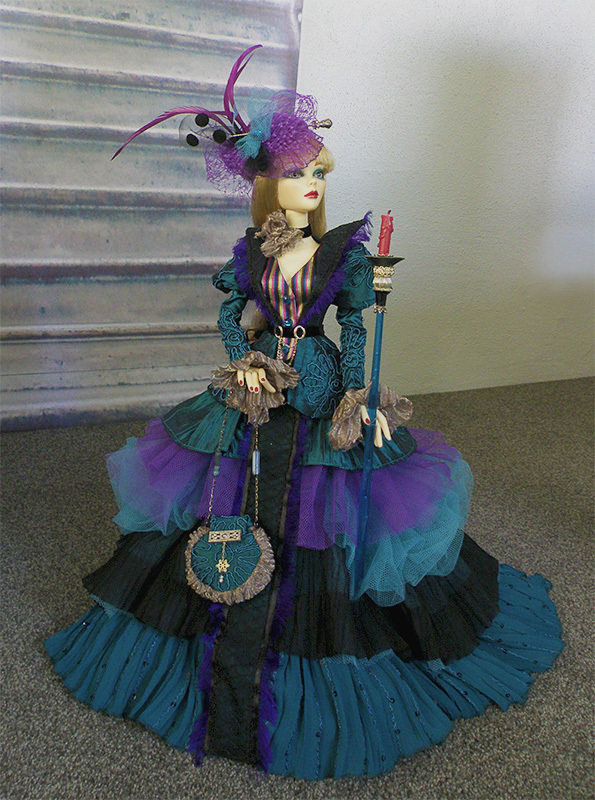 The purple self fringing on the collar & down the front panel from the silk dupioni adds the final detail. This, overlayed with black lace net makes the stripe silk vest pop from beneath it. Please enjoy the photos and do click on them to enlarge for much more detail. 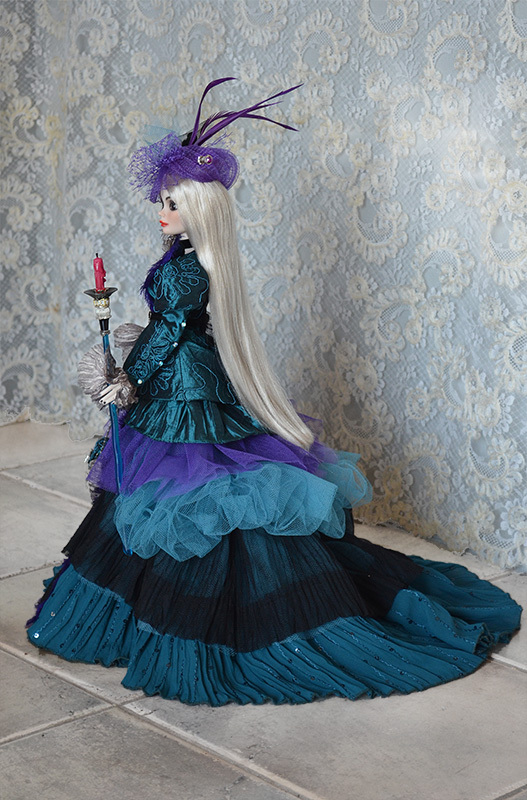 The first four photos show the outfit on the new plastic Evangeline. 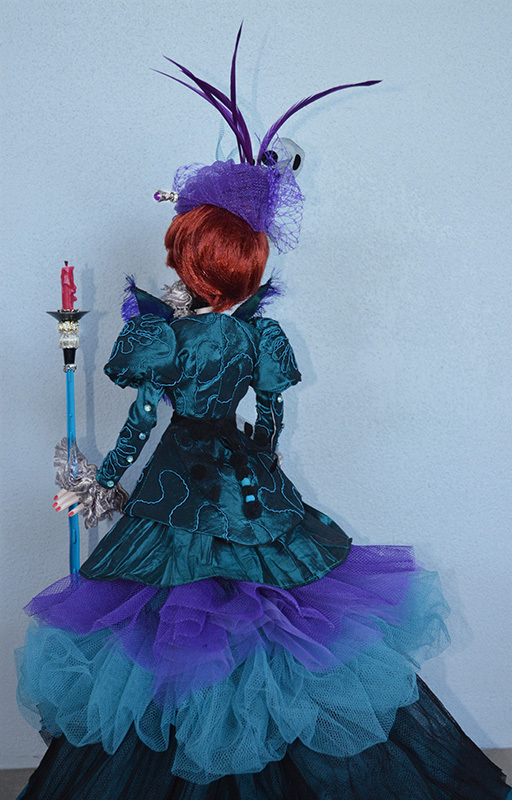 She is wearing a short wig so that the back of the jacket can be seen. The second and third photos show the jacket with the gauntlets removed and only the short sleeves remaining. The belt is velvet elastic with buckles and chains at the front and a net bow at the back closure with a pom pom tassel falling from the waist. The gauntlets attach with studs inside diamantes outside. 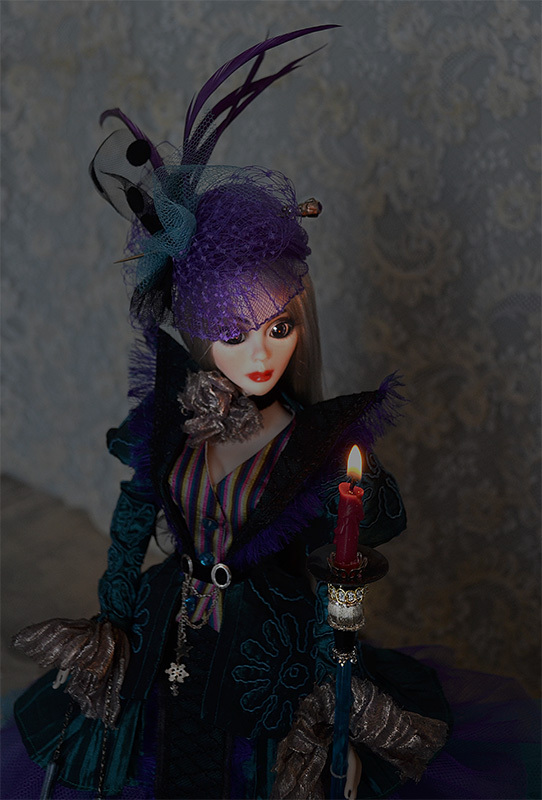 These next four photos show the outfit on the resin Evangeline.The first two photos show the full outfit including the candle holder which holds real candles that can be burnt and changed. The hat is anchored with a jeweled hatpin. The handbag is non opening. 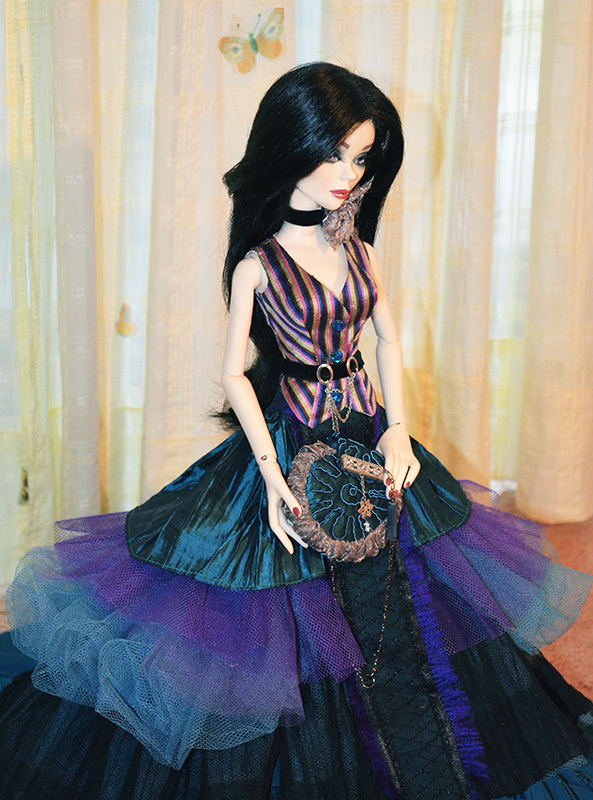 The third photo shows the skirt with just the vest and belt and the fourth photo has the gauntlets added. The colors are close on my monitor but that could be completely different depending on how yours is calibrated. So please take this into consideration. The gauntlets have silk lurex metallic crinkle frills at the wrist. 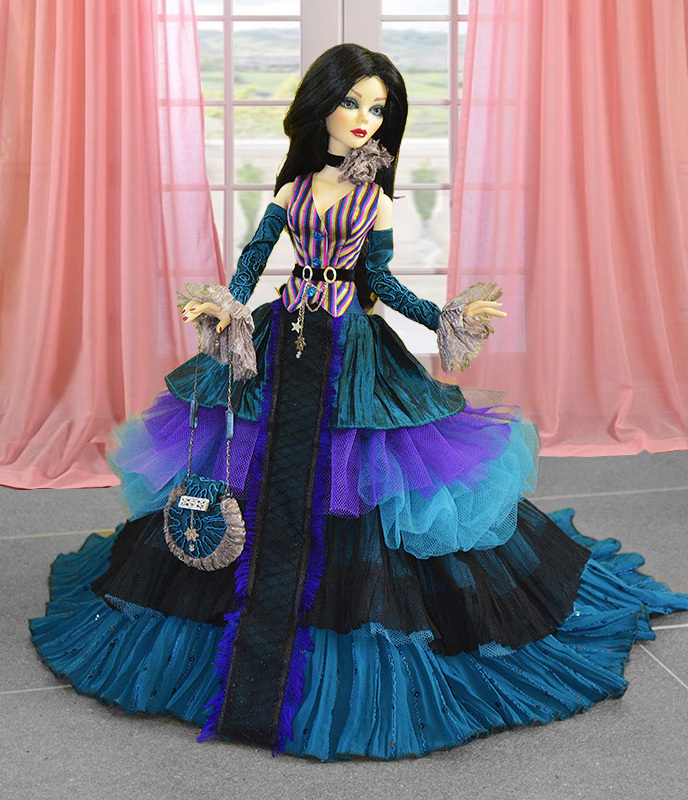 The neck trim is of the same and is on a black velvet ribbon lined with flesh fabric. 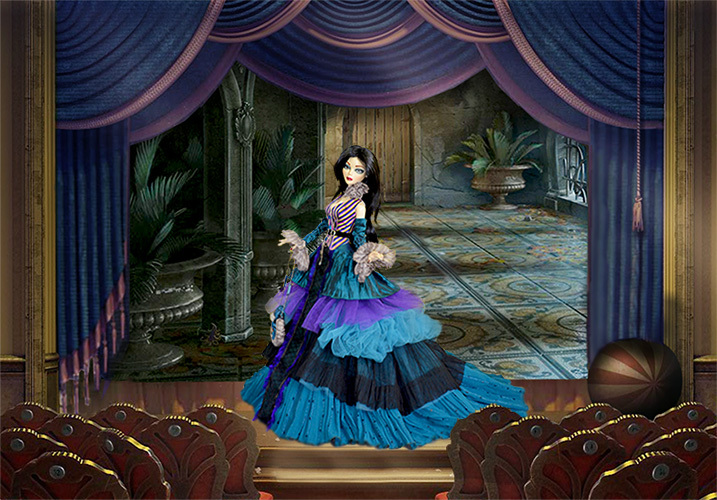 The skirt is lined with a lawn petticoat with net frilling. 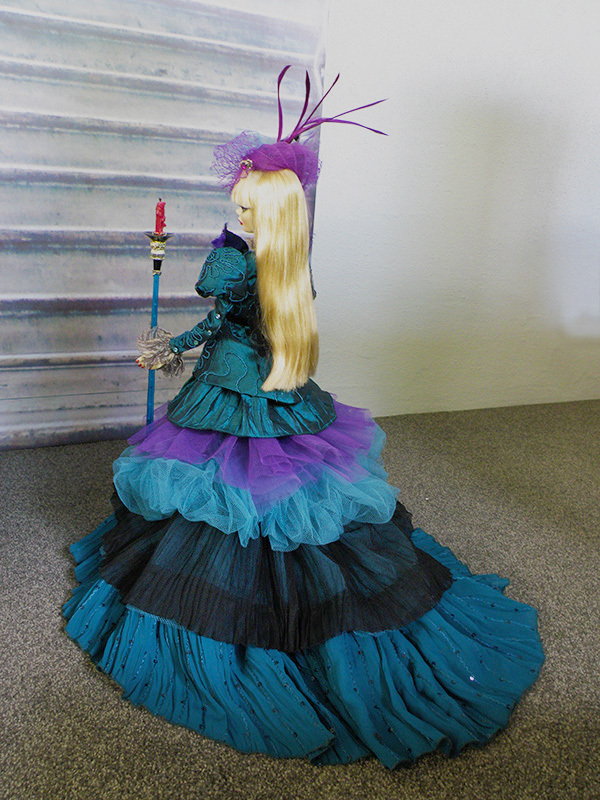 The four photos below are my vinyl Evangeline with a beautiful repaint by Angela Hoch Tittle. She is wearing the full outfit which is on the bigger side but as you can see still not a problem at all. I lit the candle to show how it works. The outfit comes with 5 spare candles (4 burnt candles with drips 1 not burnt) in different colors that will fit into the holder as replacements. 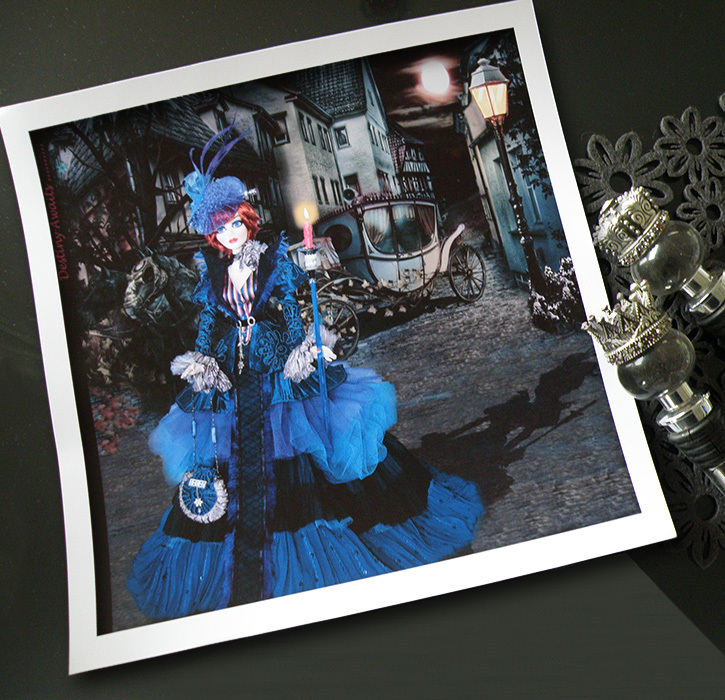 Please browse my website for more of my design work. Enjoy! !